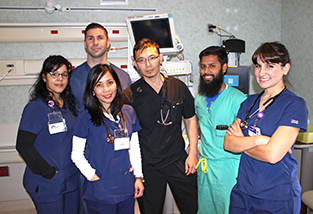 Shore Medical Center's Intensive Care Unit (ICU) is managed by Board Certified Critical Care physicians 24/7/365. The Intensivist group and our qualified ICU nursing and clinical staff provides care to our most vulnerable patients who have complex and severe illnesses requiring experts in critical care management that provide for continuous, coordinated and skilled care. An Intensivist is present and on site in the ICU 7am to 7pm to primarily manage the care of each patient, collaborating with hospital supportive staff, medical staff and being available to families to explain the patient's individual care needs, plan of care and to discuss changes in status or care plan. Between 7pm and 7am, the same Critical Care physician group is providing continuous availability and monitoring facilitated by our tele-ICU equipment in each room. This team is readily available to nursing for questions and to continue the care plan during these hours. The tele-ICU Intensivists have visual and auditory access to patients and their data via the tele-ICU and utilize Shore's EMR systems to input orders and access documentation. The Intensivist team is available to any consultants or surgeons that are part of the patient's care team, 24/7/365. The Journal of the American Medical Association (JAMA) stated that implementation of a tele-ICU program was associated with reduced adjusted odds of mortality and reduced hospital length of stay, as well as with improvements in best practice adherence and lower rates of preventable complications. A study published by the New England Healthcare Institute (NEHI) recommends that community hospitals with 10 or more ICU beds adopt tele-ICU care.